Sheki, the Khan's Palace is part of the Tentative list of Azerbaijan in order to qualify for inclusion in the World Heritage List. Site visited October 2014. While the majority of tourists in Azerbaijan may not go outside the area of Baku, Sheki is an excellent reason to go there. It is a good place to see the other side of this country as opposite of Baku: traditional architecture and small town feeling in a beautiful setting on foothills of Caucasus Mountains. And the icing on the cake is the exquisite Khan’s Palace. That was also in my mind when I headed to Sheki. At nine in the evening I hopped on a Sheki bound night train at the Baku railway station. The trip would last 10 hours. I had a bed in a four bed sleeper cabin. In the cabin were also a local father with a child and a granny. They were very friendly and in the beginning of the trip we had a cup of tea and biscuits together. They could speak only few words of English but still we could communicate with each other. At seven in the next morning the train left me alone in the darkness at Sheki railway station which is 15 kilometres away from the city. I waited at the station almost an hour for a taxi to show up. From the centre of the city I walked along the main thoroughfare of the old city towards the Khan’s Palace. The city was just waking up. It was very quiet and you could see hardly anyone on the streets. Finally I reached the Khan's Palace which is surrounded by crumbling walls of Sheki Fortress. This 18th century palace is many times referred as 'little gem' and that is really true. The building is small, beautiful and nicely restored. It has abundant and detailed decoration both outside and inside. It is possible to visit inside the palace only with guided tour which takes some 20 minutes. Photography is not allowed inside and you have to put plastic covers on your shoes for not to damage the wooden floors. While the exterior of the palace is nice with coloured geometric patterns, the interior is simply stunning. The centrepiece of this two-storied building is the big glass mosaic window which is assembled from pieces of wood and coloured Venetian glass. Each of the six rooms have their own style of decoration. The miniature paintings with exceptionally bright colours are especially admirable: pomegranate trees, birds and flowers. Maybe the most interesting single motive is the painting of ancient battle scene. Otherwise there are lots of floral and geometric ornamentations. I think ’perfect’ and ’complete’ are the right words to describe this beautiful little building. You can compare it to some of the finest palaces in Iran but in a smaller scale and in this strange rural setting. Old city of Sheki is also included in the nomination. While I found it quite nice I don't know how authentic and consistent it is. Some buildings have been recently restored and some of them seemed a bit overrestored. Basically all the important buildings are located along one street which heads towards the Khan's Palace. There are some nice traditional houses, brick mosques, bath houses and two caravanserais, one of which is nowadays a nice hotel and restaurant. Highly recommended side trip from Sheki is the village of Kish with its Albanian church. Taxi from central Sheki to Kish takes about 20 minutes. Kish is very nice traditional village with narrow winding alleys and stone houses. While I found the village itself quite interesting, the Albanian church of Kish is the usual reason to go there. While it looked a bit like Armenian church it is said to be Caucasian Albanian. In Azerbaijan there are not many places that you can call lovely or idyllic. There is grandiose and luxurious Baku, ugly and smelly oilfields, some dull and dusty plains. 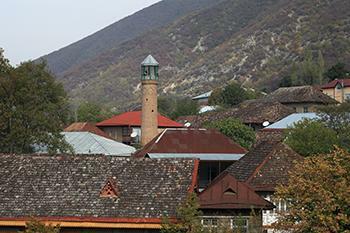 To my experience Sheki is the nearest thing to idyllic in Azerbaijan. For me the trip to Sheki gave another perspective to this country. Is this nomination enough for inscription? For Khan's Palace for sure, but is it enough. For the old city, I'm not that sure. At least I hope that Sheki with Khan’s Palace could make it because it is maybe the best option among Azerbaijan's current tentative list. This is a site probably few have heard of – I also did not know about it until I started preparing for my trip to Azerbaijan and stumbled upon this TWHS. Sheki has been an independent country between 1743 and 1813, after it wriggled itself free from Persia. It lies in the far north of Azerbaijan, just below the snow-capped peaks of the Greater Caucasus and the border with Russia. The proposed nomination Sheki, the Khan’s Palace seems to cover more than the palace alone: the town’s trade and industry neigbourhoods and vernacular architecture are included as well. Sheki was a main center of silk production in the Caucasus. It was an important stop on the trade route between “the Dagestan Mountain Traders and the main East-West Caucasus Route”, according to my Trailblazer Guide to Azerbaijan. During my trip I stayed for 2 nights in one of the two large former caravanserais in the old town: the 18th century Yuxari Caravanserai. Its grounds are nicely renovated, although the rooms are a bit damp and mouldy. But I did enjoy sitting in the little alcove in front of my room in the evenings. The houses in the old part of Sheki town are all built in a similar style: their walls are a mix of brick and cobblestones, plus wooden windows. It’s a nice and quiet place to walk around, although unfortunately there’s not much you can enter. 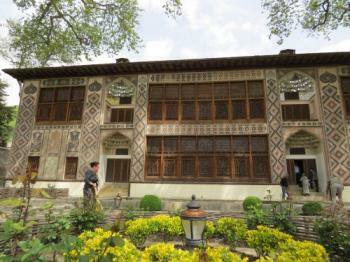 The undoubted highlight of Sheki is the 18th-century summer palace of the Khan. It was constructed in 1762, so it dates from exactly the period that Sheki was an independent state. The palace and related buildings are located above the city in a walled enclave. The palace façade is quite stunning: it consists partly of wood and partly of stone decorations. It is located in a little garden with two old plane trees in front of it. Inside you’re not allowed to take pictures, but it is even nicer than the exterior. The wooden windows are inlaid with pieces of colored glass, adding a magical sun light to the rooms. The palace is not that big, it has 6 different rooms. It was only used for business purposes, the khan’s family lived elsewhere. The main areas such as the reception hall and throne room are fully covered in murals. Most of it is figurative, but there are also hunting scenes and lively images of the victory of the army of Sheki on Persia (including heads on sticks). The grounds further contain a museum that seems not to have been refreshed since the communist era. It’s nice enough for a short visit though, it has some archaeological findings and Lenin memorabilia. Another building is set up as a shop for artisans who make the specific wooden windows with stained glass, called shebeke. A young man shows how it is made: tiny pieces of wood and glass are put together like a jigsaw puzzle (without glue or a single nail). In hindsight, the Sheki Palace was the most memorable monument that I visited in Azerbaijan. It has a very distinct architectural style that I haven’t seen anywhere else in the world. Also it has been well-kept. It provides an eye into the past of what is now the Republic of Azerbaijan.